We are in Park City for the winter, skiing with Guests or on the mountain daily and do not get to emails for 8 hours or more so emails lag in response. We reply to your email inquiry as quickly as possible. NEW NOTE FOR SUMMER LONG TERM: WE RENT TO A MAXIMUM OF FOUR PERSONS IN SUMMER AND WELCOME J1 VISAs. Our Silver Cliff Village 303 condo is a HUGE two bedroom condo (2,000 sq. ft.) at an ideal walkable location near the base of Park City Mtn. Resort, now connected to the Canyons Ski Resort by Gondola. The walls are filled with antique sporting gear: skis, snowshoes, sleds, and other surprises. 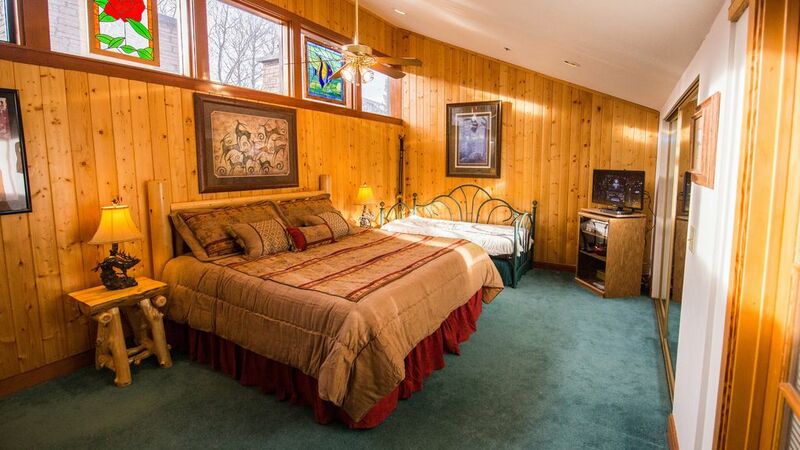 Extensive and comfortable decorating in warm mountain style and log furniture throughout greets you on arrival. There is lots of room to spread out and find your own privacy in this condo, with bedroom suites separated on two top levels. This is a top floor unit. ● High thread count silky smooth bed linens. ● Luxurious bath linens, not white thin towels. ● Extra large bath sheets for the hot tubs. ● 55 inch LED TV with Roku streaming: Netflix, Hulu, Pandora, etc..
● Cuisinart cookware, always new Teflon skillets. ● Washer and Dryer in the condo. ● 3 Flat screen TVs and 3 DVDs. We own two condos in this building and can combine rentals for larger group. Please note that during the ski season, this condo will sleep 8 persons and we will rent to your family or party of 8 or even 9. In summer on long term leases, we allow only four persons maximum in the condo to keep wear and tear on furnishings to a minimum. Each of the large bedroom suites has privacy, two vanity sinks in each bath, and TV/DVD. This condo has 2 eating areas. The dining table seats 10 and the kitchen island seats 6. A 48" LED TV, DVD, VCR, CD player, Stereo Amp w/ external speaker are in the living room. Quartz counter tops are new as are all new sofas, mattresses, and furniture. The kitchen has every known extra appliance that exists and is ready for cooking. If you need it and don't see it, we will put it in there for you. There is an all important washer/dryer inside the condo. For families, bedroom suite #2 is set up for a nanny (read Mother-in-Law) and the kids, with 2 queen beds, and DVD/VCR/TV. Children's movies are provided. Our Guests return year after year to this condo and we proudly provide great personal service for all family and singles needs including free ski mountain tours, half day snowshoe or cross country ski tour locally, or an overnight trip down to Bryce Canyon National Park for snowshoeing or x-c skiing.. Perfect for families (or two families), or singles, with the ski school in mind or those looking for the best location. 100+ yards to the ski plaza, only 6 blocks to Main Street. The ski plaza has an ice rink, shops, and restaurants, and bars, and is the home of Park City Mtn. Resort skiing. Sundance Film Festival Guests easily walk to 3 screens: Santy Auditorium, Cineplex, and Egyptian. Ask us for a further description of the location and activities for children near the condo. Sleep in; avoid cars and the morning/evening driving & parking rush. Be in the 2 hot tubs or back on the sofa before most folks get out of the ski area parking lot. Park City is a town to walk to ski in, not to be in traffic. Please reach out to us day or night for same day/next day reservations. There are HOT DEALS, and SPECIALS listed on our private website that cannot be listed here. The golf course and 20 K of groomed cross country ski trails are two blocks away. In summer, enjoy softball, B-ball, the skate board park, free movies, free music, and more sports at the City Park - one short block away. Your hosts, Don & Rosemary, have 38 years of guiding our condo Guests to great memories in all that Park City has to offer. We live in Park City each winter and offer personal service, informal ski lessons for hire, and free tours. With a combined 69 combined years of Park City experience, including working at the ski resort as Mountain Hosts/Tour Guides, we are pleased to help you in every way we can; non skier activities, restaurant recommendations, summer activities, and more. If a smaller unit is better for you, please ask...we have a ski-in/ski-out Snow Flower condo that sleeps 4, in addition to the 2 Silver Cliff Village condos. We strive for very personal service for our Guests and hope that is shows. * 100+ Yards from building to ski plaza at the Park City Ski Area. * Fireplace is wood burning. Nice log fireplace mantle and rock hearth. Hmmm, this is very easy to explain. Silver Cliff Village is 100 yards from the Park City Mtn. Resort, 4 blocks to the grocery store, 6 blocks to Main Street, and one block from the City Park. It has nearly 2,000 square feet of space on two levels; many two bedrooms are 800-1,000 sq. ft. only. We saw the potential for this condo as privacy for our Guests and room to decorate without crowding things. Other condo buildings had dark hallways, felt squeezed in and small, or just did not have a good over all feeling about them, even if the location was ok. We knew it had to be Silver Cliff the moment we walked into the condo. We feel like we are at home when we stay at Silver Cliff (it was really our home for the two years we worked at the Park City ski resort!). Feedback from our Guests says that they feel the same way about our particular condo. That makes us feel good about having it available for our family and Guests. toilet, combination tub/shower, Two vanity sinks in separate area. Attached to 2nd bedroom. toilet, combination tub/shower, There are two vanity sinks, separate from toilet area. 6 Blocks to Historic Main St: easy walk. At the base of Park City Mountain Resort Ski area: Walk to Ski! In Old Town, Park City. Only 4 blocks to groceries, pharmacy, cinema. Less to library, restaurants. Natural gas: the best kind of heating. All linens, including sofa sleeper, are provided. We provide high count, no scratchy bed linens. In this condo, full size. Separate Laundry Room. Heated garage under the building with coded entry. Password secure heated underground garage. Free parking. Elevator to unit. Luggage carts! Free broadband Wi-Fi from our condo. Password protected for our Guests. Has free parking garage under the buildng. Love seat and Queen sofa sleeper. 48' LED HD TV. Stereo, DVD, VCR. Fireplace. Door to balcony. If you have a boat for the summer, let us know so a request can be made to the HOA for a free permit. Delightful any time of year. Rock hearth and log mantel. Please see the photo. Wood not provided but easily found at the grocery store in PC. New, and a quiet one. This hummer is quiet. It doesn't even make a humming sound. New Stainless with oven, all pots and pans. Yes mam'n. Part of that stove. Abundance of extras such as coffee bean grinder, slow cooker, blender, mixer, food processor. We furnish two: One plus a spare in case one croaks. Two: One plus a spare. Salt/pepper, coffee filters and what spices accumulate over the ski season. Matching dishes, utensils, glasses of all sizes and some extra items. There is a company that will buy groceries and deliver in advance of your trip. There is delivery service for quite a few restaurants direct from their menu. Highchair is checked since we can provide 1 from a rental company . Two dining areas: Kitchen island counter (see photos) and a table separately seating 10 for dinner, dominoes, puzzles, or cards. 3 LED HD TV's: Both bedrooms, & Living Room. Cable TV with enough channels to make you cross-eyed & impede your sleep. Stereo amp, external speakers, CD player in Living Room. Trade a book library. Good stuff. Good selection of family games. Dominos, board games, jigsaw puzzles, etc. Some CDs for your use! Bring your own if you have faves. Make copies on CDR and donate....we appreciate it. For hygiene reasons, not provided. We can put you in contact with a licensed service if you need crib, high chair, or toys. Various movies in the condo, adult (not that kind) and children's. Private balcony off living room faces West. Icy in the winter time, depending on conditions. Can be enjoyable or too dang icy; if too dang icy, it means skiing is really, really good. Great in summer. Jordanelle is closest. Deer Creek is nearby. We kayak locally, please ask if you are a summer visitor. If summer bike storage is needed, please ask us about your options. We boat and can advise on where to launch yours. There are two nearby reservoirs: Jordanelle & Deer Creek. Google or ask us. Good fishing in both. We kayak there as well. Fed by Provo River. Small railed deck off the living room. We can advise on rental services for skis, boots, and snowboards that come to the condo for you. Across the street in City Park. Free. Ask us about golf courses in the area! See next blurb. Two hot tubs. 2 New Open air hot tubs just off elevator. They are separated by a privacy wall and are very, very nice; open to the falling snow and the falling sky. We can help with: Free 1/2 day snowshoe or cross country ski tour nearby to Park City (rent or bring gear) if we aren't otherwise committed. Assistance with baby needs: cribs, high chairs, baby sitters. Lift Tix: Let us know if you are skiing more than 7 days at a Vail owned Resort. We help with ski/board/boot rentals, snow mobiles, hot air ballooning, dog sled tours, snow tubing, and all activities in PC. No question goes unanswered! Don teaches skiing privately (not in ski school); please call for info. We lived in PC for 25 years, worked at the ski resort, and will help you with your family or group needs. Local's advice on restaurants. Walk to 3 Sundance Film Fest venues from our condo. Walk to groceries, Main Street, and skiing. This is a centrally located, luxury condo. Long term summer rental available! Summer Guests, our condo is 1 block from City Park, a bee hive of summer activity (Utah Beehive State pun intended). The accommodation were very comfortable and great for a family of 5. It was beautifully decorated and well equipped. Wonderful location- Cozy and comfortable- Excellent hosts! My party had a successful and comfortable stay at Silver Cliff Village this winter. The space is easy to access, homey and comfortable. We had no problems, and the hosts were very gracious. No complaints! Wow! The condo is beautiful, spacious and homey. The kitchen is really well equipped - important to us, as we like to cook and prepared most of our own meals. Lots of seating - both at the bar and at a large table. The living room is spacious, with a wood burning fireplace. Both bedrooms are large - especially the master, which is on the second level. We really liked the privacy provided by having the master upstairs. Bathrooms were great. Nice to have TVs in both bedrooms as well as the living room - especially with two college age sons. Great storage area for ski equipment as well. What made this condo exceptional? The homey touches - lots of books and games, many of which we used while we were there. It was both beautiful and comfortable - we enjoyed spending time watching movies in the evening. WiFi was terrific - no issues at all. The Location!! The location is perfect for a ski vacation - just a short 5 minute walk and you are at the lifts. Really no need to drive at all! Also a relatively short walk to downtown Park City - we walked to dinner and to shopping. The owners are absolutely fantastic - they provided detailed instructions and information, answered all of our questions and provided suggestions, and made us feel at home immediately - even a treat when we arrived. We hope to be able to return to Park City, and this condo, soon! Nice and quiet, well equipped and as advertised. Would stay again! Great location and great hosts. Very nice living space. The heated garage with an elevator to the condo us a really nice plus. We liked that Don and RoseMary had paper towel, dish soap and other essentials already there. Highly recommended if you go to Park City. Cross Country Skiing or Snowshoes 2 blocks away on the golf course. City Park one short block for summer softball, tennis, B-ball, skateboard, free concerts, free outdoor movies. Sundance Films: walk to 3 of the theater venues. Library Athletic Field is 1 block away for gentle kiddie sled rides and building snowmen. Winter horse drawn sleigh rides at the ski resort. As 'locals' and owners, we provide knowledgeable advice on all Park City activities and needs: Snowmobiles, Ice Skating, Sleigh Rides, Snowshoes, Yurt Dinners, Hot Air Balloons, Bobsleds, Mtn. Biking, Hiking, 28 Art Galleries, 120 Restaurants, and 9 Ski Areas locally that we are familiar with & can help you decide on. We love to snowshoe and can introduce you to this great outdoor activity. We lived in Park City 25 years, worked at the ski area as guides and can add a personal touch to your vacation plans. We offer snowshoe or mountain tour (free) and info on all things Utah, including the 5 National Parks. The VRBO calendar rates shown do not reflect our weekly rate; inquire for that or extended stays, or put in 7 days on the calendar and it will spit out a weekly rate for you. The VRBO calendar now blocks open nights we may have available due to their unwieldy system - if you want certain nights and they do not show open, ask even if the calendar shows booked or blocked. they may be open. If the website tells you that you are not booking the minimum nights, let us know and we will work with you. Many times VRBO is wrong and we will book the nights for you. The "Instant Quote" click box by VRBO doesn't always show our best price. We may offer discounts depending on our bookings, your length of stay, number of people, & the vagaries of the rental biz, so please inquire via a VRBO email; don't rely on the "Instant Quote" or the automatic email quote provided to you, we may do better. CANCELLATION POLICY: 50% refund if canceled 31-59 days before arrival date for all reservations. 100% refund if canceled at least 60 days before arrival date except for Christmas, Sundance, and President's Week. For these three periods, 75% refund if canceled at least 60 days prior to arrival date. No refunds for cancellations 30 days or less prior to arrival or for early departures.